Side profile and crackly crust! You sure are on a roll, Tim. Gorgeous. I think your brother's going to eat that bread before he even thinks of a camera! BTW, I like your thinking. Reminded me of when I decided to bake a seeded sourdough and stick candles in it, rather than some namby-pamby birthday cake. You are a Virtuous Baker, Tim! And your bakes are spontaneous/improvised, yet bold. after receiving the bread. Did you wrap it into some linen ? Also, is it even legal to ship food products like this ? Not that this would bother me, because I would like to send my son some freshly baked creations. Good to know re no shipping restrictions. If your brother quickly runs the whole bread through the running faucet and rebakes for about 12+- minutes in a preheated 300 oven, the crust will be nice and crunchy again. I would not attempt to mail a French type of bread and expect it to arrive in good shape. A bread made with white flour will always be stale after three days, no matter what. 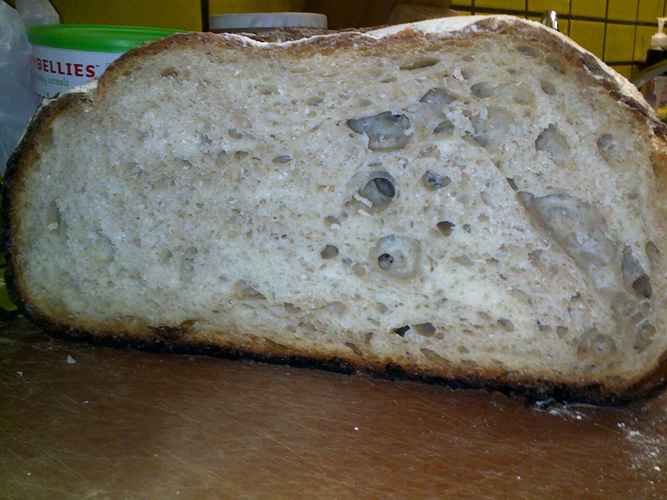 Sourdough breads with rye, whole wheat or spelt stay much longer fresh.